It is easy to initially think that dogs can pretty much eat whatever they want and be fine. Most of us have witnessed scenes in movies, cartoons, and television shows showing people handing dogs food under the table, or dumping their plates into a dog’s bowl and watching while it gleefully laps whatever is left. Unfortunately, dogs cannot eat whatever they want. In fact, many human foods are not only unhealthy for dogs, but outright dangerous. It is for this reason that you should be fully informed of what human foods your dog should avoid at all costs. Not only does this prevent you from feeding them the wrong foods, it can help you to know when your dog is in danger in case it accidentally gets ahold of something it shouldn’t! We all want what is best for our dogs, and emergency vet trips are never fun (or cheap.) With that said, here is a comprehensive list of foods your dog needs to avoid. Chocolate is one of the most dangerous human foods a dog can eat, as it is responsible for thousands of emergency veterinarian trips each year. It contains theobromine, which is very toxic to your dog’s digestive system. The darker the chocolate, the higher the theobromine content. Dogs are good at sniffing out chocolate and other candies that you may have lying around, or left somewhere on a kitchen counter. Never leave these anywhere a dog can reach them — just a few pieces can cause a big problem. If you discover that your dog has consumed chocolate, call your vet right away. Garlic is found in lots of foods, which is one of the many reasons you should not let your dog eat your leftovers. Full of certain compounds that are harmful to your dog, excessive garlic amounts can have a detrimental effect on your dog’s red blood cells, and may even lead to the need of a blood transfusion in some cases. While it is unlikely that your dog is going to be enticed by garlic sitting on a kitchen counter, it is still best to keep it out of reach. Bones are one of the first things humans think of as treats for a dog, and it is easy to understand why. Not all bones are created equal however, and bones that have been cooked pose a threat to your dog. Sure, it is tempting to want to toss some chicken, ham, or turkey bones your dog’s way after you are done eating or cooking, but cooked bones has the tendency to splinter while your dog is chewing on them. This can cause choking and other serious problems, including punctured intestines. Always go with raw bones instead, and always supervise your dog with any bone. Grapes can seem like a natural, easy treat to give your dog, but they are certainly not. It is not fully known what compounds in grapes are so harmful for a dog, but the effects are definitely known. Kidney failure, vomiting, diarrhea, and lethargy are all common issues caused by grape consumption, so avoid these for your dog at all costs. Although not as potent as garlic, onions and chives are also a part of the allium family, all of which should be avoided by your dog, including any foods that may contain them. Like garlic, onions and chives can cause problems to your dog’s red blood cells, resulting in lethargy and a host of other issues as well. Aside from having a high fat content, avocados also contain a high amount of persin, which is very toxic when ingested by dogs. Persin can cause upset stomachs, breathing difficulties, and even fluid buildup in the chest. Whole avocados not only contain persi, but also the seed itself — something that can cause intestinal blockage and require surgery if ingested. While the thought of giving a dog the rest of your ice cream cone may seem cute, it is not the best of ideas. Dogs tend to be lactose intolerant, and the vast majority have problems digesting it. This leads to a wide range of unpleasant stomach problems, and small percentage of dogs could suffer even more severe effects. Steer clear of ice cream for your dog altogether, it is just not worth it. There are more than a few types of nuts that dogs can have, but macadamia nuts are not part of the group at all. They are highly toxic to dogs, and like grapes, the reason is still rather unclear. Regardless, macadamia nuts are among the most dangerous things a dog can ingest. Weakness, gait, vomiting, and even tremors can occur as a result. Never leave these out around your dogs. Dogs lack the right enzymes in their bodies that can efficiently break down sugars. Foods with high sugar can cause varying degrees of problems if ingested. Not only is sugar bad in the short term for your dog, it can eventually cause issues such as diabetes and obesity. 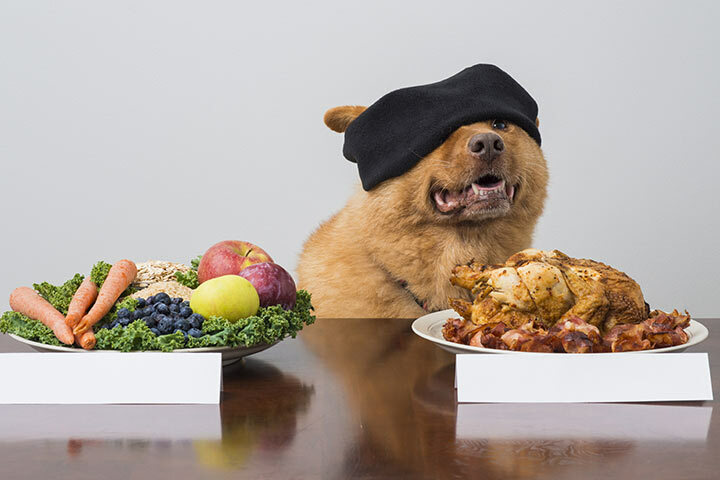 There are many human foods that are perfectly fine for dogs when given in moderation. While it is not a good idea to make these foods a regular part of your dog’s diet, they are good to give them every now and then, or a few times a week in between or with meals. Use good judgement in regards to portion size and your dog’s weight. If your dog can handle small amounts of lactose, cheese is a great choice for small treats during training, or just because. Cheese cubes are a good choice to keep around, as their portion size makes them good to use as treats. Avoid rich cheeses, and stick with low fat varieties instead. Perhaps one of the most popular choices to use as a treat, peanut butter is beloved by most any dog. Peanut butter contains heart-healthy fats, protein, and vitamins B and E and niacin. If possible, opt for the raw, unsalted peanut butter varieties, and definitely avoid any brand that contains xylitol — a frequently-used sugar substitute that is toxic for dogs. It may seem a bit odd at first thought, but popcorn is in fact quite a good treat for dogs. Popcorn is light and not filling at all, making it a good choice to use as treats when training your dog. You can reward your dog 20-30 times with a single popcorn kernel without giving your pup much substance at all. Popcorn is also good on the nutrition side of things, as it contains riboflavin, thiamine, protein, and vitamin E. Make sure you avoid any salt and butter, and always be sure that you discard any unpopped kernels. Coconut is not not only a healthy diet choice for your dog, it also has plenty of topical applications as well. Lauric is prevalent in coconut, which bodes well for your dog’s immune system. Coconut is also good for bad breath, and can be ingested to help aid with skin issues like hot spots, flea allergies, and persistent itching. Pieces, oil, and milk are all fine for your dog, just make sure you remove the furry outside shell covering. Honey is great for humans, and it is great for dogs as well. It contains vitamins A, B, C, D, E, and K, along with potassium, calcium, magnesium, copper, and several different antioxidants. Giving your pooch a tablespoon of local honey twice a day can even provide easing to their allergies by introducing small amounts of pollen to their systems. Honey can even be used on a dog’s skin for cuts and burns. Many specialty dog foods these days contain tuna, and for good reason. Fresh, cooked tuna is very high in omega-3 fatty acids that help to promote and sustain better eyesight and heart health. While fresh is ideal, canned or pouch tuna can be used, but only in moderation due to higher mercury and sodium content. If you do use these varieties, make sure they are packed in water instead of oil, and lack any extra spices. Bread is okay for your dogs, but it does not really offer much in the way of nutritional value. Still, it can be used as filler, or combined with a bit of peanut butter. Fresh bakery breads are more ideal, as they don’t contain any preservatives or excess sugars. If you do go with store-bought bread, avoid any varieties that contain high fructose corn syrup, and avoid breads with added sugars or fruits. Paw Pals provides numerous services for your pets during the times when you can’t be at home with them. Our caring, pet-loving staff is happy to walk your dogs and even stay at your home with them when you are either away for work, or on longer trips. Our convenient and personalized services ensure the well-being and happiness of your pets when you are away, giving you peace of mind and a happier pets! Contact us today to learn more about what we can do for both you and your furry pals.